The kidneys function by filtering the blood at the glomerulus and then progressively modifying the composition of this filtrate through the length of the nephron. Whatever fluid remains following nephronic processing of the filtrate is excreted as urine. Modification of the glomerular filtrate by the nephron occurs mostly by resorption of water and small molecules through the nephronic barrier and subsequently into the peritubular capillaries. In a certain cases, the nephronic barrier can secrete small molecules from the peritubular capillaries through the nephronic barrier and into the nephronic fluid. Below we highlight a variety of important principles which will help frame the remainder of the discussion on the mechanistic basis of urine formation. The kidneys filter a quantitatively large volume of extracellular fluid each day which necessitates a nearly equally large volume of filtrate resorption. The total volume of plasma which undergoes filtration is roughly 180L/day whereas the entire body's extracellular fluid (ECF) is only 11L. Consequently, all of the ECF is processed by the kidneys several times each day allowing for rapid elimination of toxins and metabolic waste products. This enormous rate of renal filtration necessitates an equally large rate of tubular resorption without which the body's ECF would be rapidly depleted. Consequently, the rate of tubular resorption must be tightly matched to that of glomerular filtration as even a 1% error of under-resorption would lead to a loss of 1.8L of water and solutes in the urine, given a glomerular filtration rate of 180L/day. In general, the total volume of filtrate resorbed by the kidneys is roughly 179L/day resulting in only about 1L/day of urine excretion. A major question of renal physiology has been how specificity in urine formation is achieved, or in other words what is the basic mechanism by which desired solutes are retained in the plasma whereas undesirable solutes are excreted in the urine. It is now clear that although glomerular filtration is highly selective for molecular size, it is nearly totally non-specific for chemical composition; consequently, any solute with a small enough molecular weight will undergo filtration through the glomerulus and into the nephron. This allows for even foreign, exogenous toxins which humans have never evolutionarily encountered to be filtered and excreted into the urine. In contrast, tubular resorption is highly specific and tightly regulated, and is the mechanistic source of specificity in urine formation. Tubular resorption is generally characterized by specific resorption of particular solutes from the nephron into the peritubular capillaries whereas anything that is not resorbed is eliminated as urine. In some instances, solutes are specifically secreted from the peritubular capillaries and into the nephron, although this is less common. Small solutes can be transported across the nephronic barrier through two basic mechanisms. Paracellular Transport occurs between cells, through tight junctions. In contrast, Transcellular Transport occurs through cells, with molecules crossing the cellular membranes via proteinacious channels or porters. Water and solutes can be transported across the nephronic barrier via two basic mechanistic routes, either between tubular epithelial cells, termed the "Paracellular Route", or through the tubular epithelial cells, termed the "Transcellular Route". In contrast to the nephronic barrier, transport across the peritubular capillary wall occurs through completely non-specific bulk ultrafiltration and is thus governed by starling forces. Paracellular transport refers to movement of water or solutes between tubular epithelial cells and thus through their tight junctions. Importantly, tight junctions in different parts of the nephron possess different levels of permeability, thus changing the contribution of the paracellular route to total fluid transport across the nephronic barrier. Transcellular transport refers to movement of water or solutes through tubular epithelial cells and thus through their plasma membrane. This requires the presence of membrane porters or channels that are typically highly specific for transport of particular molecules. The specificity provided by membrane porters and channels is the major molecular mechanism by which specificity in tubular resorption is achieved. 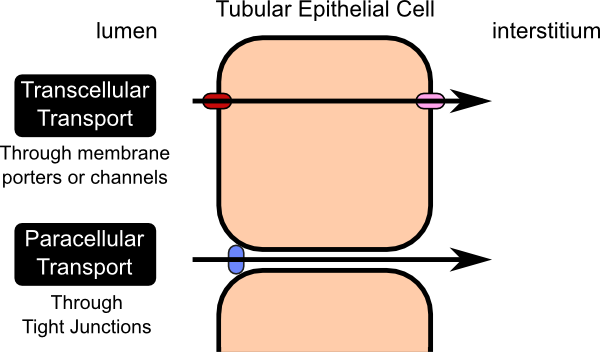 The fact that tubular epithelial cells in different segments of the nephron possesses different varieties of membrane proteins allows for functional specialization of these nephronic segments for transport of different molecules. Movement of molecules across cellular membranes can occur via three basic energetic processes. In passive transport, the molecules simply flow down their electrochemical gradient. In primary active transport, the energetic release of ATP consumption is directly coupled to movement of the molecule across the membrane. In secondary active transport, the energy stored in the electrochemical gradient of a molecule previously having undergone primary active transport (blue triangle) is released to power the transport of a second molecule against its concentration gradient (yellow square). Transport of water and solutes across the nephronic barrier ultimately requires the release of energy to actuate the movement of these molecules. In certain cases, the energy released is due to the elimination of an electrochemical gradient for that solute, and this is termed passive transport. In other cases, termed Active Transport, the molecule is transported against its electrochemical gradient and the energy is derived from consumption of ATP. Passive Transport across the nephronic barrier, either paracellularly or transcellularly, occurs when molecules run down their electrochemical gradients. Because this process is itself thermodynamically favorable, no additional energy is required to actuate this motion. It should be noted that in the special case of water the equivalent concept of an electrochemical gradient is that of osmolarity and thus passive transport of water occurs via osmosis. Importantly, all water in the nephron is transported passively and thus is actuated by transport of osmotically active solutes, particularly Na+. Active Transport refers to transport of molecules across the nephronic barrier against their electrochemical gradient. Because this is thermodynamically unfavorable on its own, it must be compensated by the consumption of a highly energetic molecule, generally ATP. 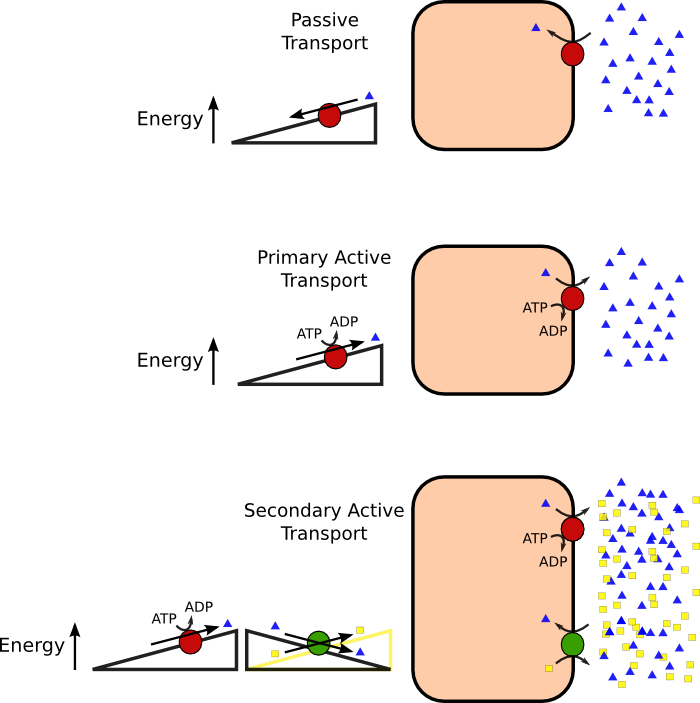 When active transport is referred to as "Primary" (Primary Active Transport), transport of the molecule against its electrochemical gradient is directly actuated by consumption of ATP to ADP. This is generally carried out by membrane porters which molecularly link ATP consumption with transport of the molecule across the membrane. Examples of primary active transport are relatively few in renal physiology and are limited to the NaK ATPase, HK ATPase, and H+ ATPase. When active transport is referred to as "Secondary" (Secondary Active Transport), transport of the molecule against its electrochemical gradient is indirectly linked to ATP consumption. In such cases, the membrane porter molecularly links transport of the molecule in question, say Molecule A, with transport of a previously primary active transported molecule, say Molecule B, down B's electrochemical gradient. Therefore, the energy to actively transport Molecule A, is indirectly linked to ATP consumption via elimination of Molecule B's electrochemical gradient, previously established via primary active transport. In the case of renal physiology, most secondarily actively transported molecules use the Na+ gradient established by the NaK ATPase.